The Battle of Camden was a major victory for the British in the Southern theater of the Revolutionary War. On August 16, British forces under Lieutenant General Charles Cornwallis routed the American forces of Major General Horatio Gates about 5 miles north of Camden, South Carolina, strengthening the British hold on the Carolinas following the capture of Charleston. 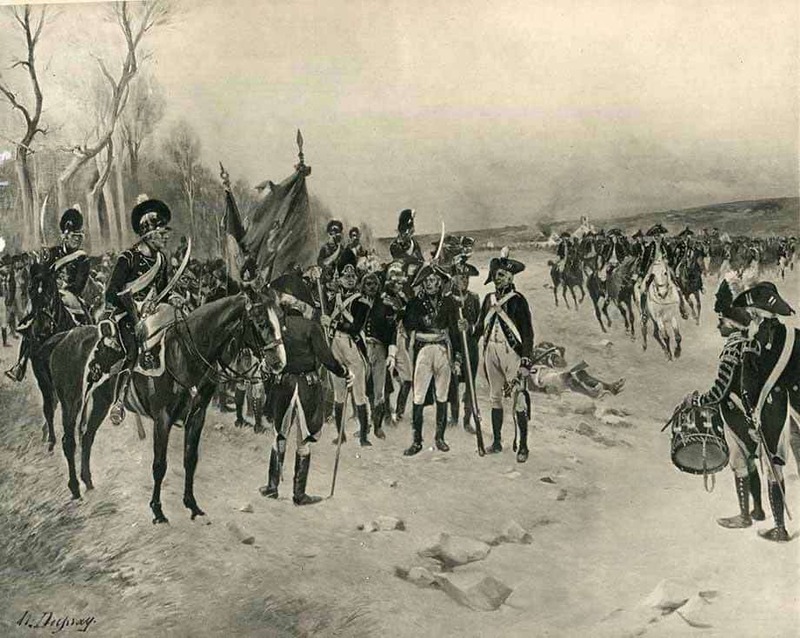 Armies - American Forces was commanded by Maj. Gen. Horatio Gates and consisted of about 3,700 Soldiers. British Forces was commanded by Lt. Gen. Charles Cornwallis and consisted of about 2,200 Soldiers. Casualties - American casualties were estimated to be 900 killed/wounded and 1,000 captured.. British casualties were estimated to be 68 killed, 245 wounded, and 11 missing. 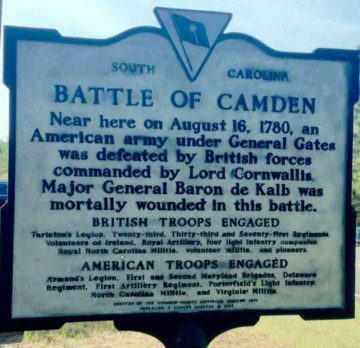 Camden was Lt. Gen. Charles Cornwallis's most important interior garrison and logistical supply depot. Camden was a small but strategically located crossroads town by the Wateree River and Catawba Indian Trail and was about 115 miles northwest of Charleston. Cornwallis was left with the task of capturing the rest of South Carolina. Over the next few months, Camden became an important base of operations for the British army. The town of Camden was central to controlling the back country of South Carolina because of its crossroads location. The threatening situation in the Carolinas alarmed Congress and Gen. George Washington. Measures were taken to protect the distressed section. On July 25, Maj. Gen. Horatio Gates arrived at Brig. Gen. Johann Baron de Kalb's Patriot camp on the Deep River in North Carolina. 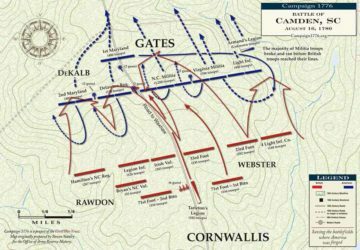 Gates decided to advance to the nearest British outpost at Camden, which had a 1,000-man garrison, commanded by Lt. Col. Francis Rawdon. On July 27, the Patriots set out for Camden. Gates had chosen a direct march to Camden through difficult, swampy terrain against the advice of his officers, who were familiar with the area. They had recommended a route that would have started out west, then turned south. It was more indirect, but was through Patriot-friendly regions, which meant they could collect some desperately needed food and supplies. The route Gates chose was more difficult, but it was through unfriendly territory. Gates also weakened his force during this time by sending 400 men to assist Col. Thomas Sumter, who had requested reinforcements to conduct his own raids. Gates' original strategy was to use Maj. Gen. Francis Marion and Sumter to cut off Camden's supply lines from the south. This action would leave Camden vulnerable and force the British to evacuate their garrison without a fight. Gates had counted on Cornwallis remaining in Charleston. Rawdon advanced from Camden to meet the Patriots and took a position on a creek, northeast of the town. Upon Gates’ approach, Rawdon fell back to Camden. On August 3, Gates joined up with 2,000 North Carolina militia, commanded by Col. James Calwell. This doubled the army to a force of 4,100 men. A few days later, Gates was joined by 700 Virginia miliamen. For some reason, Gates convinced himself that he had a total of 7,000 men. Moreover, he discounted a warning that many of the men were sick. An old -time ritual was for the men to get a rum ration, thinking that this made for a smooth functioning army. Not having any rum with him, Gates gave the men some molassas as a substitute. The molassas and bad food created a sudden epidemic of dysentary among the troops. Gates had found the journey south difficult and the anticipated supplies for his army had not turned up along the route. The men had ended up eating green apples and unripened peaches. On August 7, Gates was joined by 2,100 North Carolina militiamen under the command of Gen. Richard Caswell. At Rugeley's Mill, 15 miles north of Camden, 700 Virginia Militia under the command of Gen. Edward Stevens joined Gates' "Grand Army". In addition, Gates had Armand's Legion. However, at this stage, Gates no longer had the help of Marion's or Sumter's men, and in fact had sent 400 of his Continental's to help Sumter with a planned attack on a British supply convoy. Gates also refused the help of Col. William Washington's cavalry. Apparently, Gates planned on building defensive works 5.5 miles north of Camden in an effort to force British abandonment of that important town. Gates told his aide Thomas Pinckney he had no intention of attacking the British with an army consisting mostly of militia. Camden was garrisoned by about 1,000 men under Lord Rawdon. General Cornwallis, alerted to Gates' movement on August 9, marched from Charleston with reinforcements, arriving at Camden on August 13, increasing the effective British troop strength to 2,239 men. 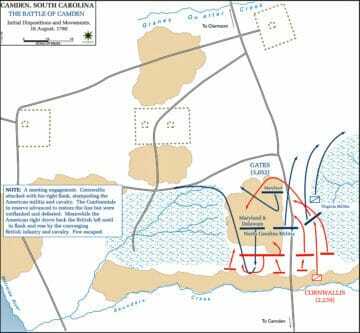 On August 14, after learning of the approach of Gates and his army, Cornwallis returned from Charleston with 1,000 regulars to rejoin his troops in Camden Instead of waiting for Gates to attck him at Camden, Cornwallis decided to go on the offensive. He made a night advance which collided with the Patriots, who were also advancing to make an assault. On August 15, Gates ordered a night march to commence at 10:00 PM, despite his army of 3,052, of which two-thirds were militia, having never maneuvered together. Unfortunately, their evening meal acted as a purgative while they marched, with Armand's horse in the lead. On a collision course was Cornwallis' army, also on a 10:00 PM night march, with Tarleton's dragoons in the lead. A short period of confusion ensued when both forces collided around 2:00 AM, but both sides soon separated, not wanting a night battle. On August 16, Gates formed up before first light. On his right flank he placed Mordecai Gist's 2nd Maryland (three regiments) and the Delaware Regiment, with Baron de Kalb in overall command of the right wing. On his left flank, he placed Caswell's 1,800 North Carolina militia, left of them were Stevens' 700 Virginians, and behind the Virginians were 120 of Armand's Legion. Gates and staff stayed behind the reserve force, Smallwood's the 1st Maryland Regiment, about 200 yards behind the battle line. Thus, the total number of Continentals on the field numbered 900. Gates placed seven guns along the line, manned by about 100 men. Also present, but whose disposition was unknown, were 70 mounted volunteer South Carolinians. 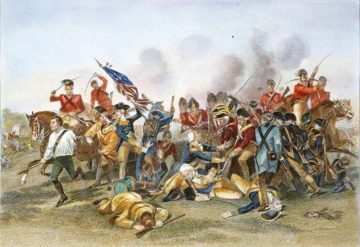 Gates' formation, though a typical British practice of the time, placed his weakest troops against the most experienced British regiments, while his best troops would face only the weaker elements of the British forces. Cornwallis had roughly 2,239 men, including Loyalist militia and Volunteers of Ireland. Cornwallis also had the infamous and highly experienced Tarleton's Legion, who were formidable in a pursuit situation. Cornwallis formed his army in two brigades. Lord Rawdon was in command of the left, facing the Continental Infantry with the Irish Volunteers, Banastre Tarleton's infantry and the Loyalist troops. On the right was Lt. Col James Webster, facing the inexperienced militia with the 23rd Royal Welch Fusiliers and the 33rd Regiment of Foot. In reserve, Cornwallis had two battalions of the 71st Regiment of Foot and Tarleton's cavalry force. He also placed four guns in the British center. 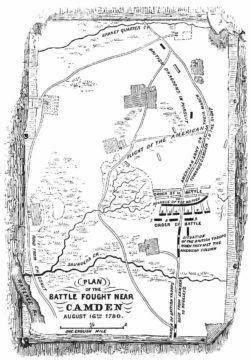 On August 16, around 2:00 AM, advance cavalry elements of the opposing armies stumbled into one another on the old Waxhaws Road about 5 miles north of Camden. Both sides pulled back to await dawn's daylight. When Gates discovered that he was facing Cornwallis and an experienced British force, he decided that it was too late to retreat and prepared for combat. The battlefield hemmed into a narrow front by the swamps along Gum Creek. Gates formed his men, but he made a fatal decision. The right wing was comprised of 900 Maryland and Delaware infantry, commanded by Major General Johann de Kalb. Gates placed on the left wing some 2,500 untried North Carolina and Virginia militia and a handful of cavalry and other light infantry behind them. There were also 7 artillery pieces throughout the line. This formation placed the least reliable troops in front of the best British Regulars. About 200 yards behind the front line, Gates stayed with the reserve, which was comprised of 3 small Maryland regiments straddling the road. When the British appeared on the field, Cornwallis formed his army on either side of the Waxhaws Road. He placed Rawdon on the left wing, opposite of de Kalb. Cornwallis then placed Lt. Col. James Webster on the right wing, opposite the inexperienced Patriot militia. Col. Banastre Tarleton's Legion and cavalry was placed in reserve. Four artillery pieces were placed in the center of his line. The British opened the battle by using their right wing to attack the Patriot left wing. In the face of an aggressive British bayonet charge, the militia fled before the British could even reach them. The Virginians broke and ran. Only one company of militia managed to get off a few shots before fleeing. 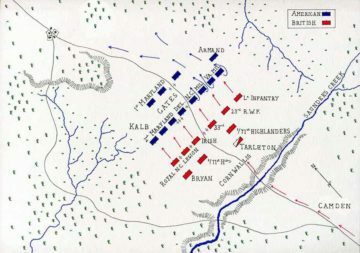 The pell-mell panic quickly spread to the North Carolina militia and they also fled, breaking through the Maryland Continentals. Seeing the wholesale panic of his entire left wing, Gates mounted a horse and took to the road with his militia, leaving the battle under control of his subordinate officers. In only a matter of minutes, the entire left wing of the Patriot force had evaporated. 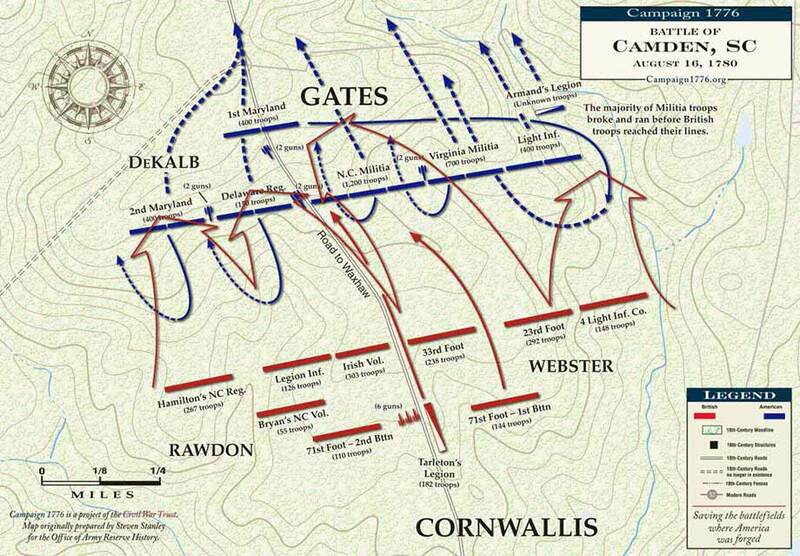 While the rout was taking place on the left flank, de Kalb's right flank was attacking after receiving the order from Gates. 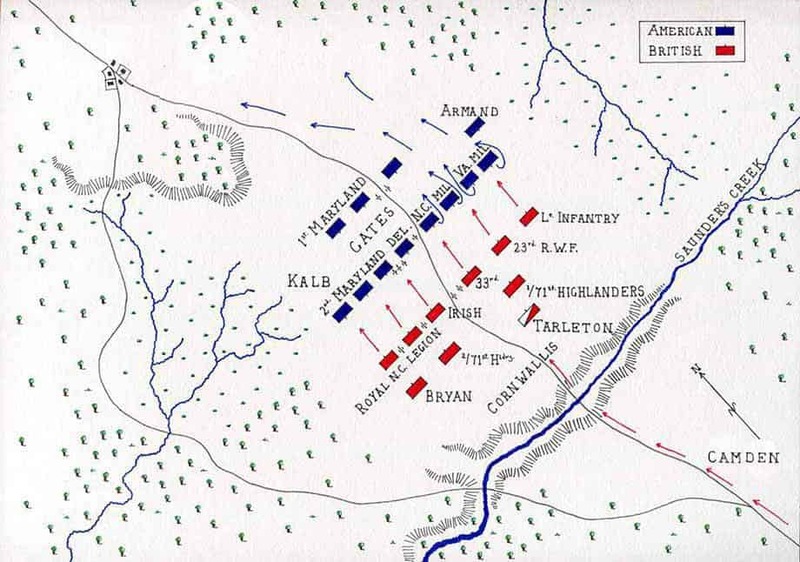 The Continentals twice repulsed Rawdon's troops and then launched a counterattack. The Continental counterattack was successful and the Rawdon's line was nearly broken. Cornwallis saw the action and was forced to ride into the action and steady his men. Meanwhile, instead of pursuing the fleeing militia, Webster wheeled to the left and continued his charge as a flanking movement against de Kalb. The North Carolina militia regiment that had been stationed closest to the Delware Continentals held its ground, the only militia regiment to do so. They fought well and was joined by Maryland Continentals that had been called up from reserve by de Kalb. The Marylanders fought off Webster's attack, but now only about 800 Continentals were facing at least 2,000 British regulars. The final blow came when Cornwallis ordered Tarleton to attack the Patriot rear. Under the cavalry charge, the Patriots finally broke. Some managed to escape through the swamp and de Kalb was struck 11 times before falling. The field was taken after an hour of fighting. Tarleton pursued the fleeing Patriots for over 20 miles before finally turning back. Gates, mounted on a swift horse, was in 60 miles away in Charlotte, North Carolina, by that evening. About 60 Continentals rallied as a rear guard and managed to protect the retreating troops through the surrounding woods and swamps. Gates proceeded onwards to Hillsborough, a distance of 180 miles, where he arrived on the 19th and then composed his report to Congress on August 20. The report to the President of the Continental Congress, , Samuel Huntington, began, "In deepest Distress and Anxiety of Mind, I am obliged to acquaint your Excellency with the Total Defeat of the Troops under my Command." In an August 30 letter to General George Washington, Gates wrote, "But if being unfortunate is solely a Reason sufficient for removing me from Command I shall most cheerfully submit to the Orders of Congress; and resign an office few Generals would be anxious to possess..."
Gates' actions were almost immediately questioned. After Major General Nathanael Greene replaced him in December, Gates returned home to Virginia to await a inquiry into his conduct during the battle. A Congressional inquiry in 1782 cleared him of wrongdoing, accepting his claim that his reason for leaving was to reach safety so that he could rebuild his army. He would not hold another command for the rest of the war, but did return to active duty before the end of the war, serving in Washington's command staff. Greene succeeded Gates as the new commander of the Continental forces in the South. This loss left the American morale in the South at a low and the region firmly under British control until Geene built the Continental forces back up in early 1781. At Camden, de Kalb died 3 days after the battle.